The previous Kia Soul was the start of a new dawn in youthful design for the Korean firm, and four years after the first arrived, it’s come full circle once again. Designed in California, this tough supermini mixes city-centre ability with rugged quasi off-road looks, taking its inspiration from the 2012 Trackster concept. The traditional Kia 'bow-tie' grille has been reworked while the Soul is also offered with LED lights front and rear for the first time. It’s grown in size too, the wheelbase extended by 20m and overall width up by 15mm – all the while its height remains the same. The result is a more spacious cabin, with front legroom up 20mm and shoulder room increased by 7mm. Add to that the larger boot opening, and increased overall load capacity, and it’s clear the new Soul is more practical than ever. Inside, the Soul has leapt up-market too, with soft-touch plastics featuring throughout while top-spec models will come with leather seats and high-quality piano black trim. It sticks with the circular theme though, a round motif used for nearly every bit of switchgear – including the new push button start. The biggest news with the Soul’s interior is the availability of a huge eight-inch touchscreen and the debut of the firm’s UVO eServices though. Using an Android-based operating system, which is also compatible with the iPhone, it is designed to make smartphone connectivity even easier – and in a world first comes with on-board instructional videos to outline its functions and operating controls. You can expect it to be better to drive too, the all-new chassis is 29% stiffer than before, while redesigned suspension has been implemented to give better ride comfort across a wider range of terrain. Buyers will be able to choose between the latest versions of Kia's 1.6-litre GDi petrol and CRDi diesel engines, as well as six-speed manual and automatic transmissions. Both engines are carried over from the outgoing model, and feature improved efficiency with lower emissions. The 2014 Soul will be available in Europe with a range of new features depending on the model you choose including: automatic climate control, cruise control, heated front and rear seats and panoramic glass sunroof. The car will also come in a range of brand new colours – including Inferno Red and Solar Yellow. We’ll have the full Kia Soul review on Parkers as soon as it hits our shores, so check back then for a definitive verdict. 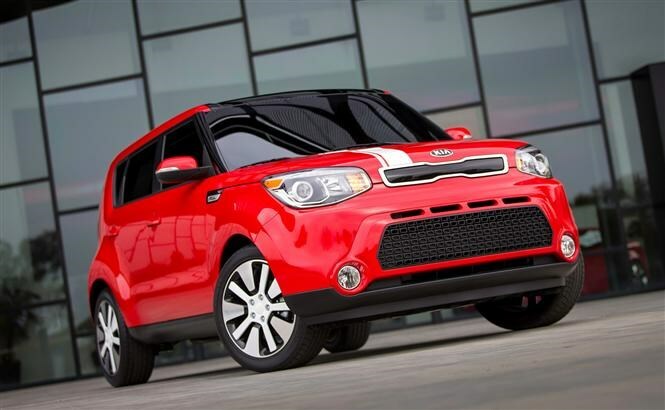 Did you know the most popular review for the Soul range is the Kia Soul SUV review.